Reuben Duncan, Superintendent and David Reilly, Facilities Director of the Jaffrey-Rindge School District (SAU 47) were quite proud to announce that their energy upgrades have saved the district over $50,000 this winter. They led a tour of the school on April 24th to show off the upgrades which were executed over the last year as part of an energy performance contract with EEI (Energy Efficient Investments). This project was comprised of many components, including new building controls, insulation, ventilation, and heat distribution improvements. 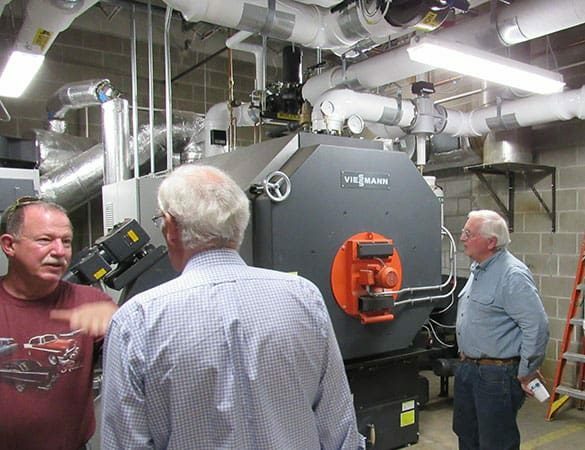 Froling Energy’s contribution was the installation of a large, PDC-burning biomass boiler in the high school’s boiler room. We also installed two new propane boilers in the middle school for peaking and backup functionality. Our crews joined these two boiler rooms together into a central distribution loop so that all areas of the two adjoining schools can be heated by either boiler room. Froling Energy delivered 307 tons of PDCs to the schools’ silo last winter which we calculated to have offset 28,820 gallons of oil. Considering the recent increases in the price of oil, David Reilly believes they made this investment at the perfect time. The district saved over $25,000 in oil cost last winter and they will save more next winter. All totaled, the full package of energy improvements saved over $50,000 for the district last winter. While the dollar savings are very important, the improved comfort and happiness of their staff and students have made this project a tremendous success.